Sankhu is a small village in the east of the Kathmandu Valley, in Nepal. It is a sacred site of Buddhism associated with Vajrayogini, as well as an important Hindu shrine. It is considered one of the oldest of the Kathmandu Valley and records go back as far as the 5th century AD. This power place is also known as the Eighty Siddhas as there are four of five caves where the great siddhas of India are said to have stayed. Even though some say that the Eighty Siddhas resided there together, this is highly unlikely since they didn't all live at the same time and never formed a community that moved about as a group. One of the caves is also said to have been the practice cave of Nagarjuna, and an image of the great master which was originally in the cave has been taken outside and placed some distance away. The present temple was built by Raja Prakas Malla in 1655. 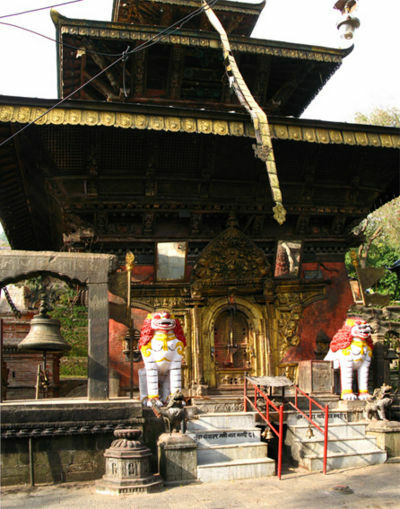 It enshrines the main sacred representations of this site, Ugra-tara manifesting as Ekazati, which are said to give very powerful blessings, particularly the image in the upper temple. The image in the lower temple is red in colour with one face and four arms, two of which hold a skull-cup (Skt. kapala) and knife at her heart, and the remaining two hold a sword and an utpala lotus. In the upper temple is an identical image of Ugra-tara in bell metal, in which her left leg is outstretched. In the upper temple is the loom of the Nepali Princess Brhikuti, spouse of the Tibetan king Songtsen Gampo. In both the upper and lower temples, Vajrayogini is flanked by Baghini and Singhini, the Tiger and Lion-headed Yoginis. In the same upper room in the upper temple is a solid bronze standing Buddha and a standing Lokeshvara. Below this shrine room is a small room containing self-arisen (swayambhu) stupa in stone. On the hill behind there is a courtyard in the centre of which is a basin containing the “Water of the Kalpa” which never dries up. In the building immediately to the left of the stairs, there is also an eternal fire or “Fire of the Kalpa”. Further up, on top of the hill, is the Mani-linga. There the Buddha, in a previous life as Bodhisattva Manichuda, remained in samadhi for a long time. On one occasion, he cut off his head protuberance and offered it as a gift. That protuberance—or a likeness of it in stone—remains here and is called “Mani-linga”. Padmasambhava made a pilgrimage to Sankhu where he met Shakyadevi and took her to Yangleshö. Vairotsana, leaving Tibet after his teachings were slandered, stopped in Nepal and offered a golden icon to the monastery of Sankhu. Guru Rinpoche left a number of termas in Sankhu and around. This page was last edited on 30 January 2012, at 15:33.